The company culture at The Container Store is based upon communicating everything with everyone. The company culture at The Container Store is based upon communicating everything with everyone. Employees, according to Kip Tindell, feel included when everything is communicated with them. Kip delivers the same updates to the company’s board of directors as he does to employees. The only topic that’s off limits are salaries, everything else is discussable. Kip compares a business to a football team. Players on the football team need to know the score and need to know what the other players are doing, why they are doing it and where they are doing it. If one player doesn’t know what the other players are doing, a football team is sure to lose. Same goes for a business and at The Container Store, the leadership mindset is one of sharing as much information as possible to all levels of employees. Sales numbers and goals are shared every day with all employees for their store and for other stores in the region. 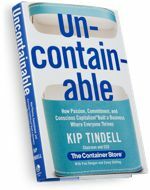 Instead of operating on a “need to know” basis, The Container Store follows a “must know” communication philosophy with employees. The company knows its employees will benefit from having more information because it will help them to do a better job, become a better employee and lead The Container Store to future success.